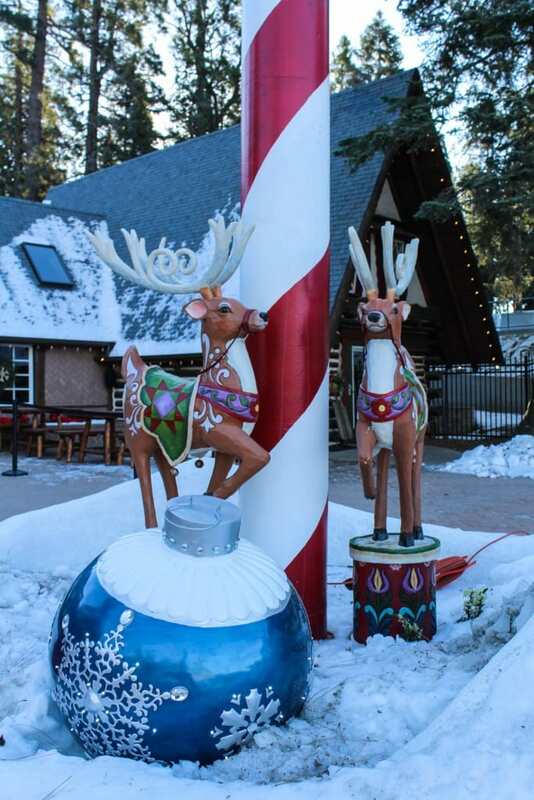 Last year, I took Field Trip Girl and Field Trip Boy on a merrymaking adventure to visit the all new Santa’s Village near Lake Arrowhead, California. 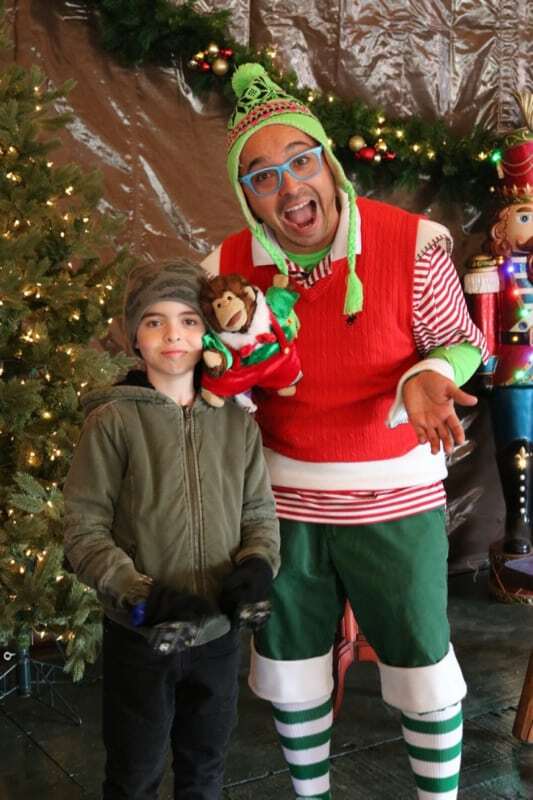 We were among nearly 300 adults and children who braved the cold temperatures, with wind chills as low as 20 degrees, to attend the reopening of the park, now officially called SkyPark at Santa’s Village. 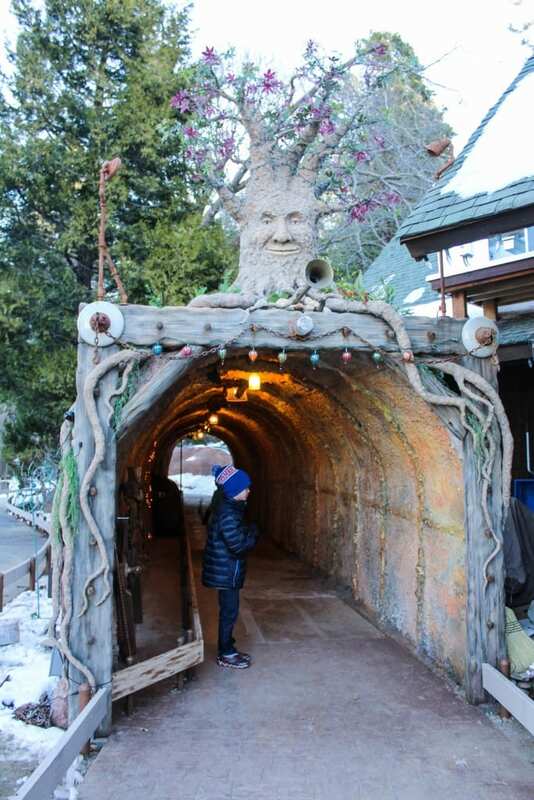 This year, SoCal Field Trips sent our blog contributor, Fran Sawyer, and her family back up the mountain to check out the latest enhancements they had made to the Christmas theme park. We have been following the theme park’s restoration process for sometime now on social media, and wanted see the outcome for ourselves. So when Fran arrived early in the morning, the village was slowly awakening from years of slumber. 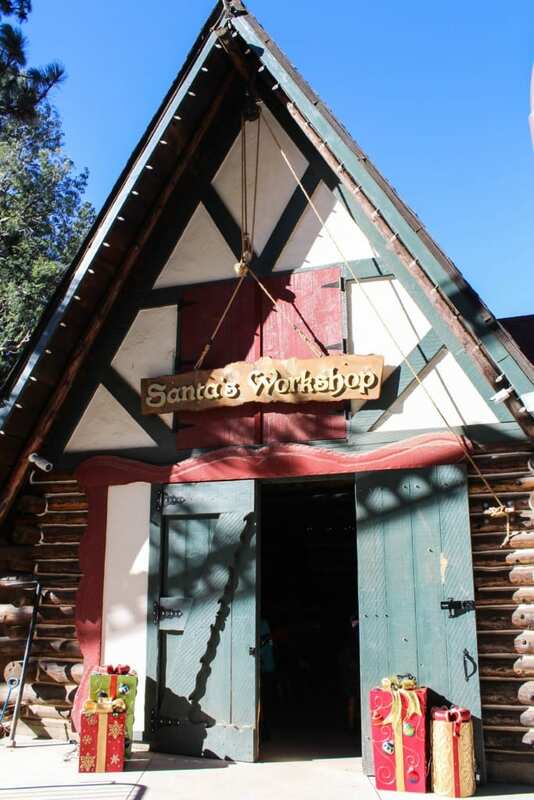 Santa’s Village originally opened on Memorial Day weekend in 1955. 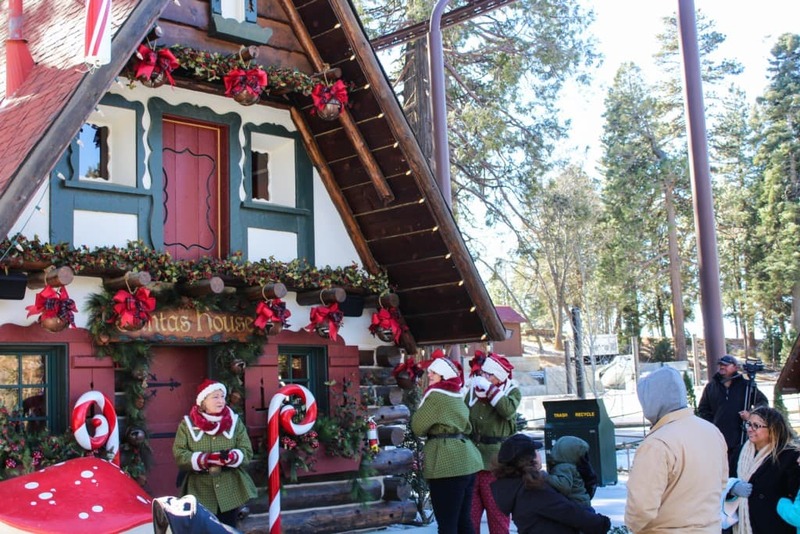 Glen Holland, a local Crestline resident, built the original park on 15 acres of the total 230 acres, which were leased to Santa’s Village by the Henck Family. The holiday theme park operated for approximately 23 years and became the first franchised theme park in the country. 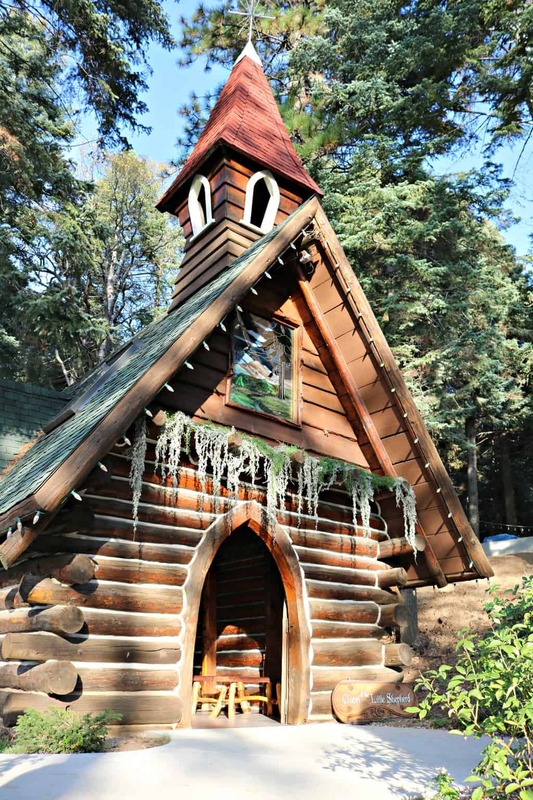 Due to lack of finances, the “Old Fire” of 2003 and a bark beetle infestation that weakened the already drought stricken trees, Santa’s Village was left desolate for many years. But then in 2015, new owners purchased the land and made restoring the historic qualities of the park paramount in their efforts to bring the old theme park back to it’s full glory. 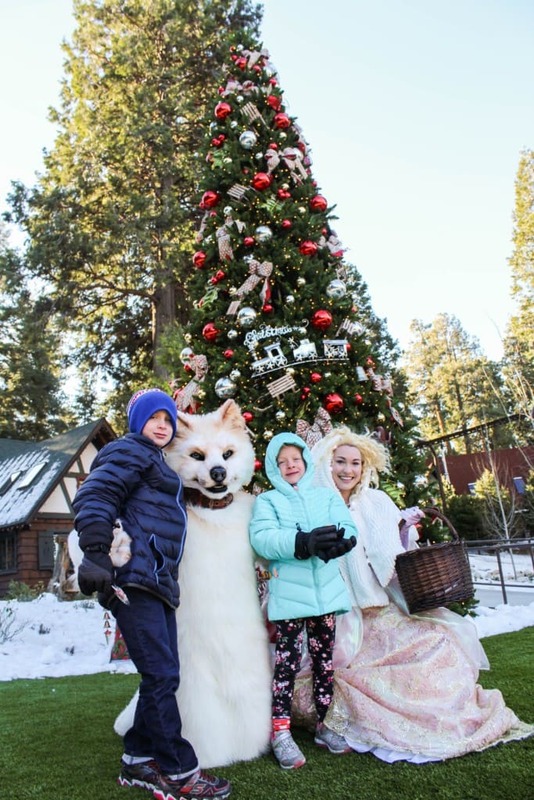 Today, Santa’s Village creates a memorable experience for guests to savor the nostalgia of an “Old World Christmas in the Woods” with family and friends. 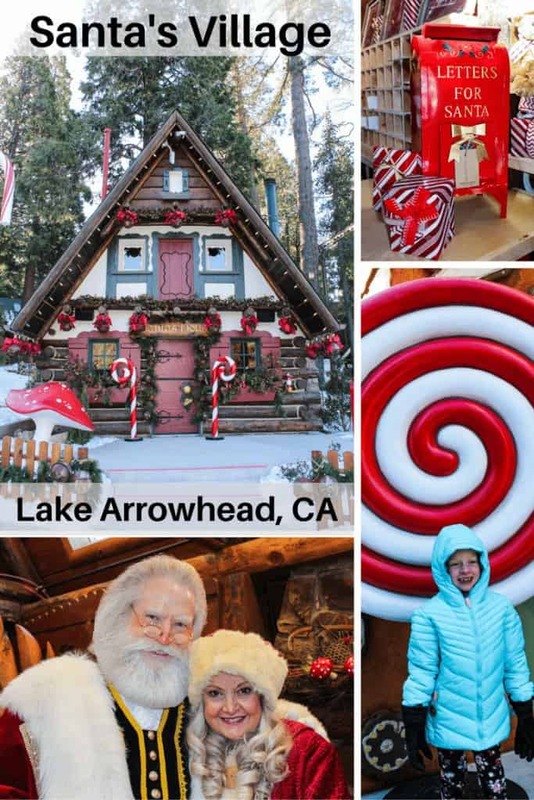 There are many things to do and see at Santa’s Village which are included in the general price of admission. Visiting with Mr. & Mrs. 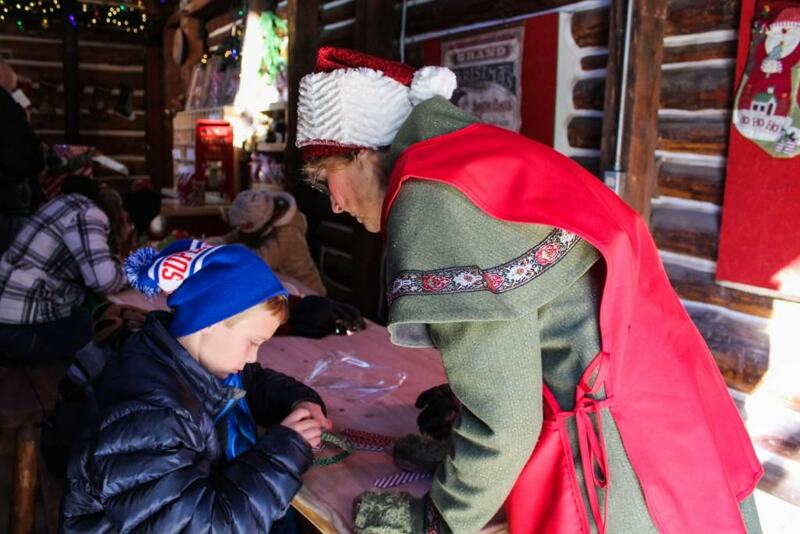 Clause in Santa’s Cabin is the most popular activity at Santa’s Village. All good girls and boys get to sign Santa’s Good Book when they visit. 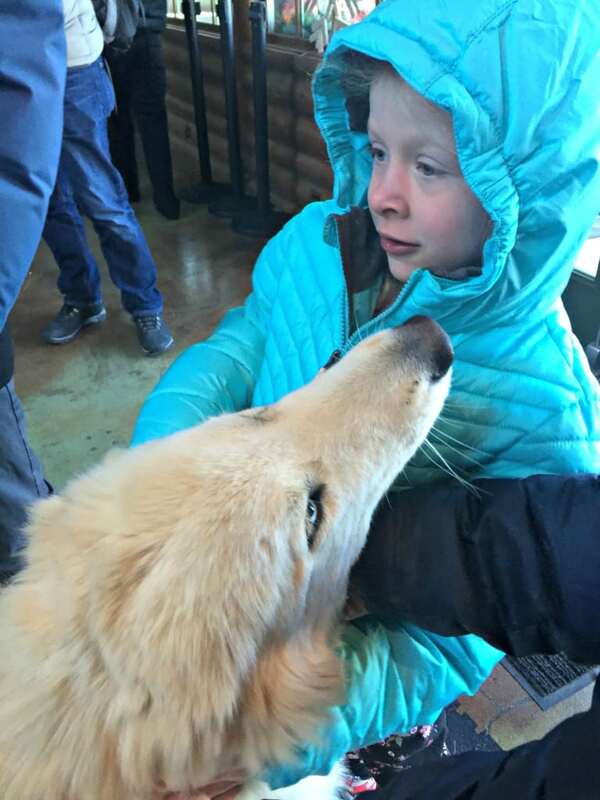 However, waiting in line to see Santa outdoors can be tough when it snows, especially on the weekends. Baby, it’s cold outside! 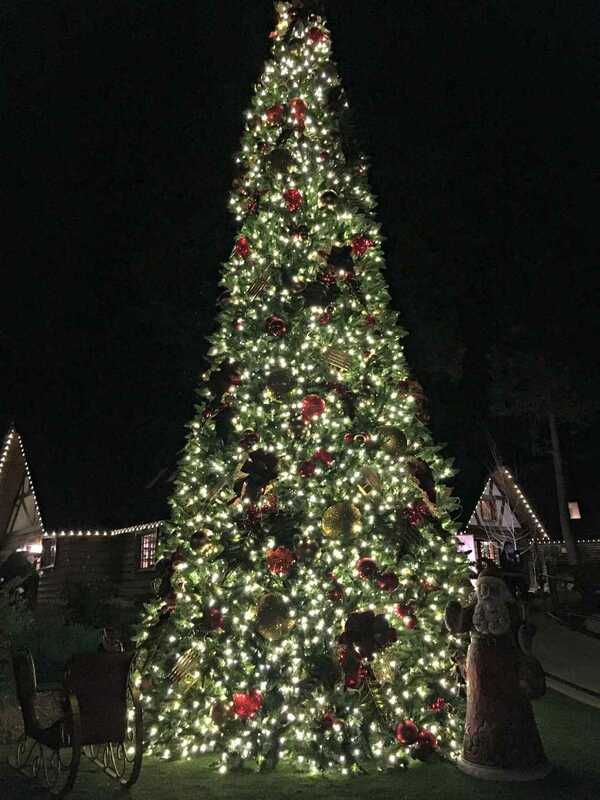 So to help cut down on your wait time, I recommend that you have one adult save your spot in line, while another adult takes your child to visit other areas of the park such as Santa’s Workshop, Arrow’s Adventure or Santa’s Village Mining Co. Keep your cell phone close by though, so you can be notified when your time to see Santa is up. I also recommend that you wear warm clothes in the winter and dress in layers in the summer. You just never know what the weather will be like on the mountain. 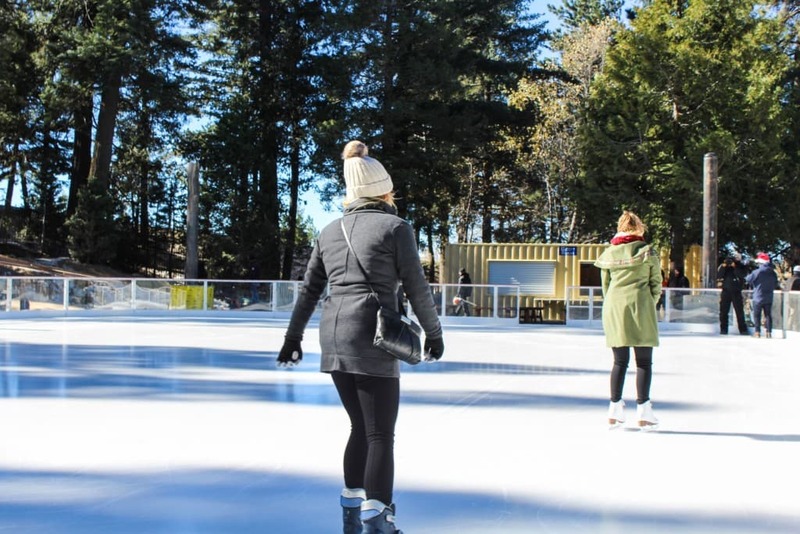 You can feel the clean mountain air as you glide across this beautiful outdoor rink. You are welcome to bring your own ice skates or use theirs. Appropriate for kids ages 2 and up. 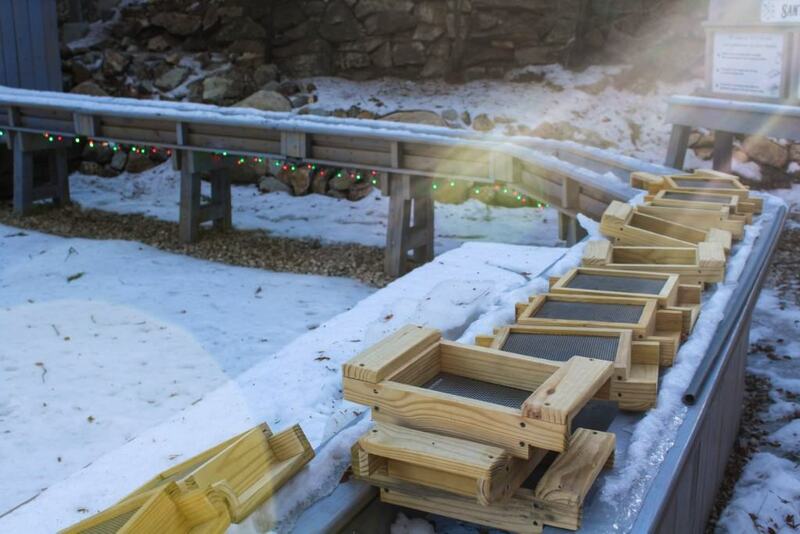 Take a ride through the Frostbite Tunnel on this miniature train ride on wheels. 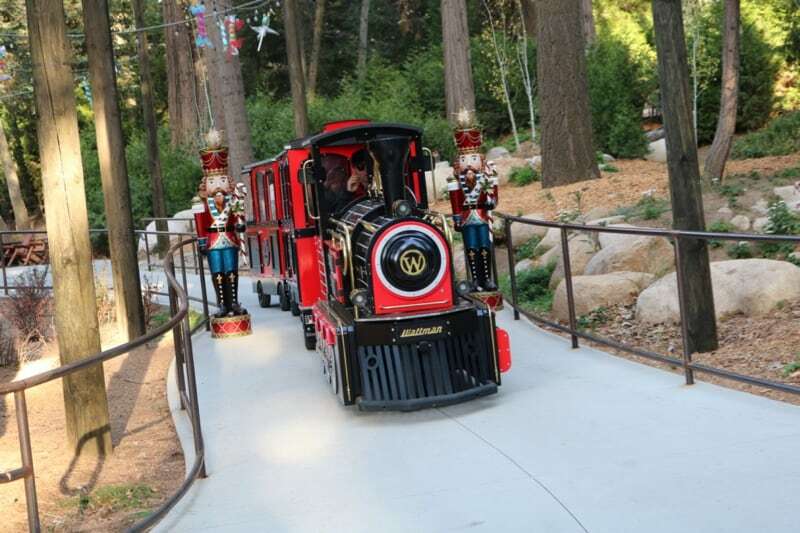 The train operates approximately every 10 to 15 minutes and is a great way to see the village while drinking a cup of hot coco. 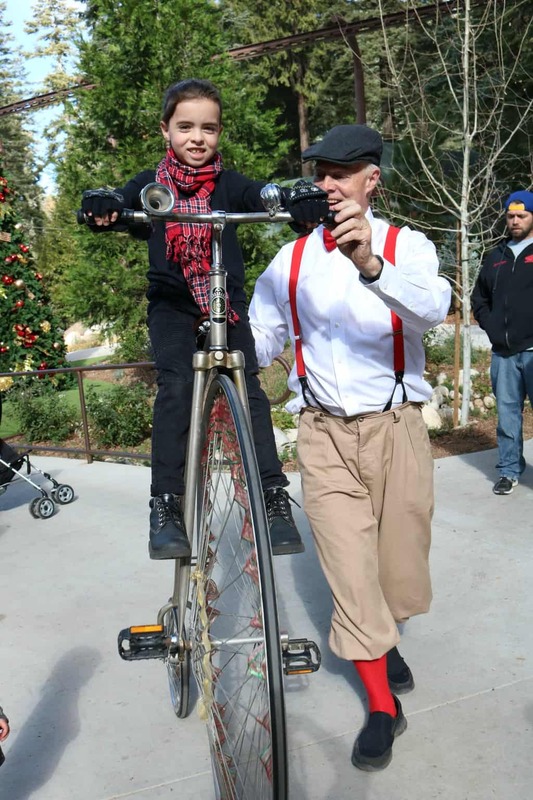 On the day Fran and her family visited, there was also an employee riding his antique high-wheeler around and the kids got to give it a try! 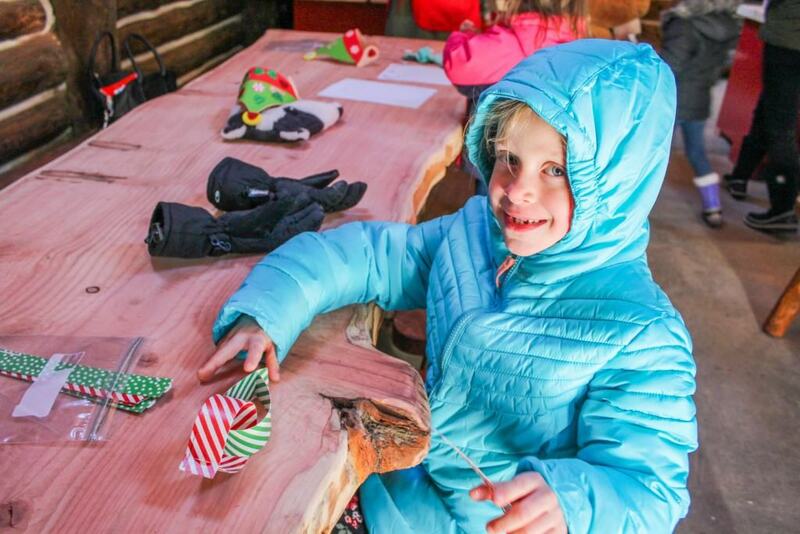 Here, Field Trip Girl and Field Trip Boy got to make two holiday crafts and write personal letters to Santa Clause. 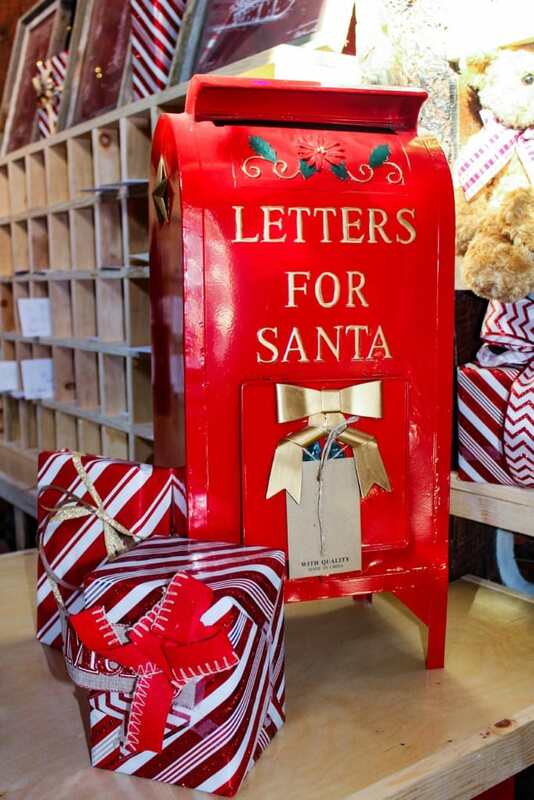 Your child can choose to either hand deliver their letter to Santa over at Santa’s Cabin or put it in the North Pole’s mailbox. 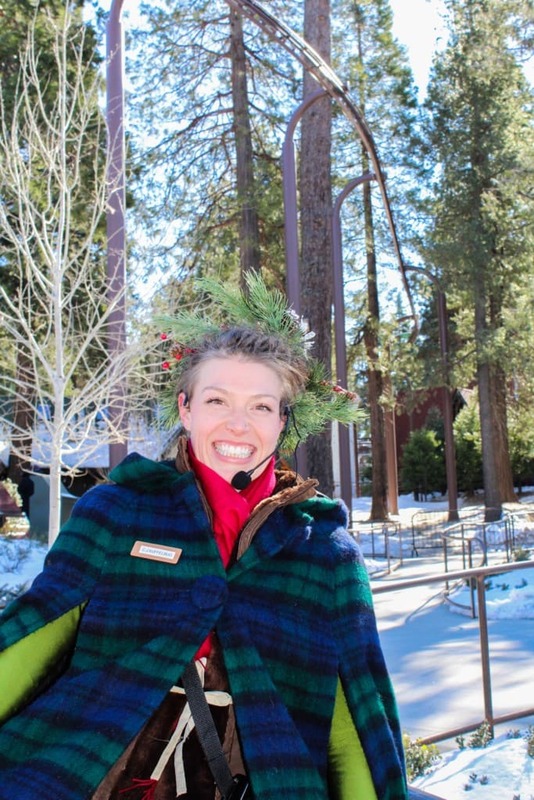 Santa’s Elves are also available to assist visitors. 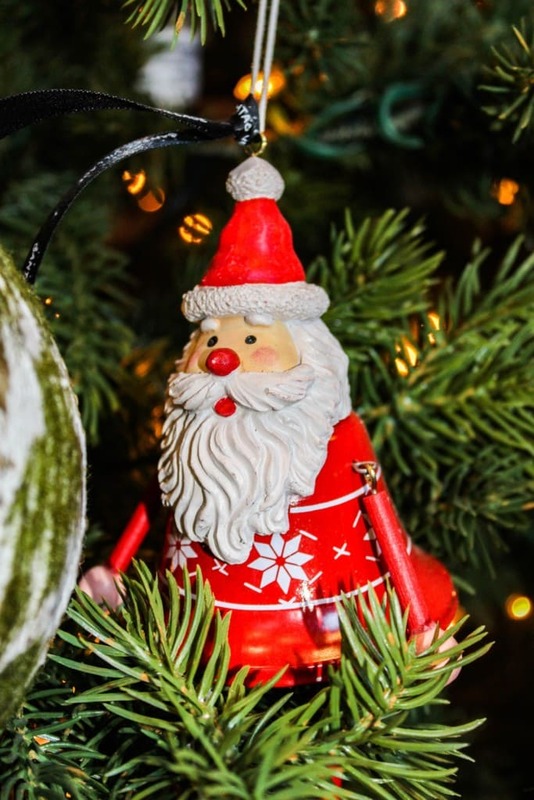 Did you know that Santa Claus has a pet named Arrow? I had no idea either! Sometimes visitors have the chance to meet him on the property like we did. 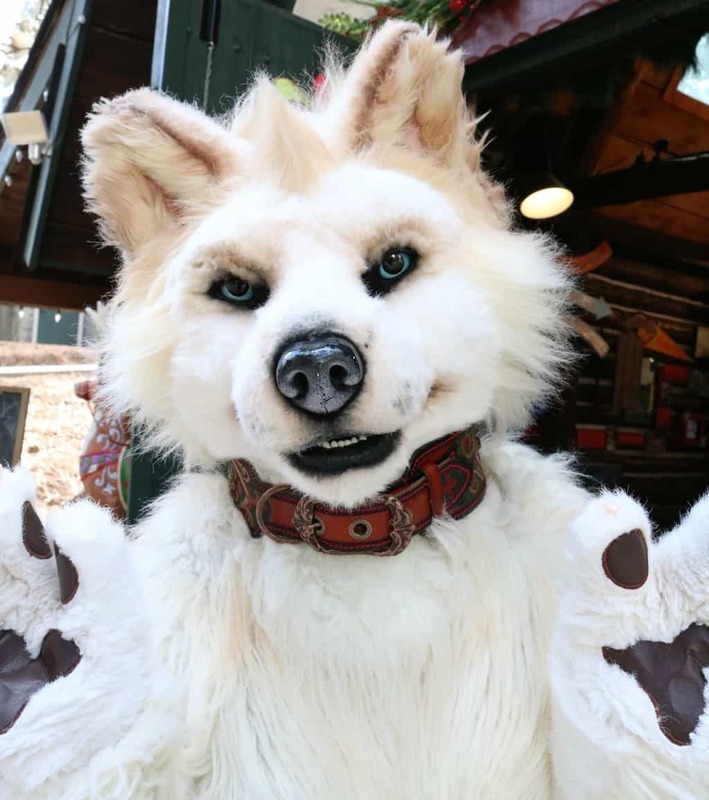 He is quite friendly and very approachable. 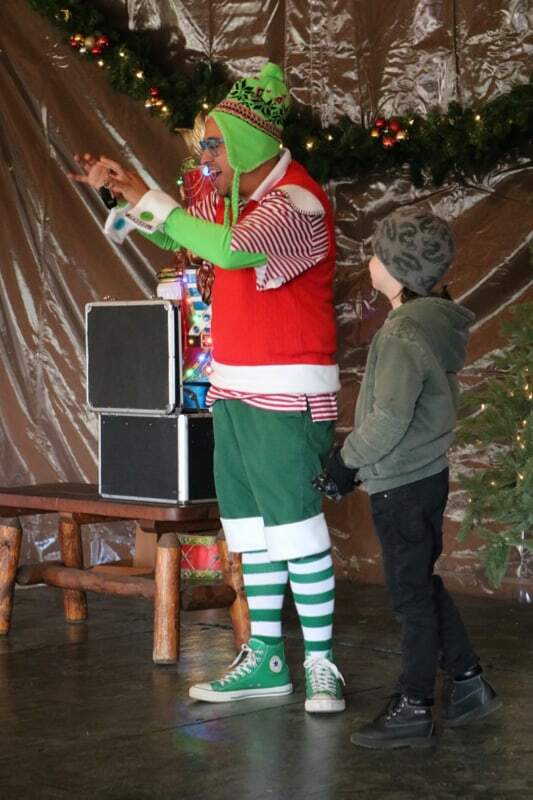 Arrow is also the mascot of Santa’s Village. 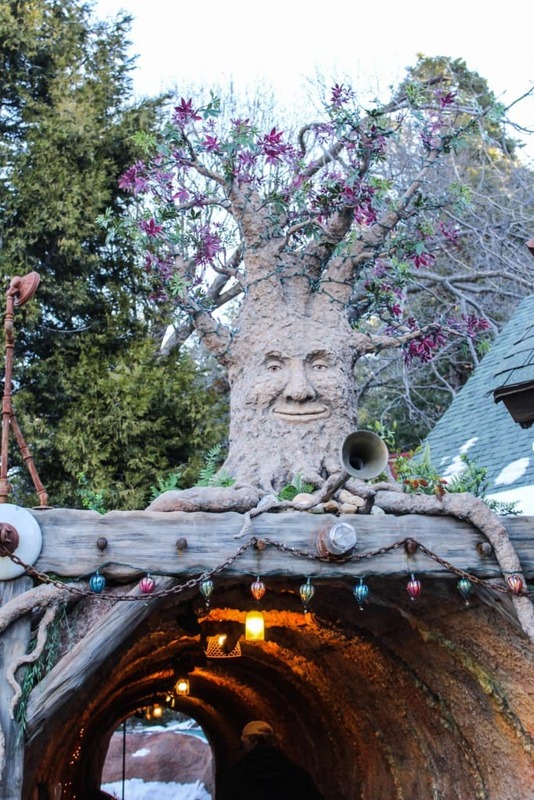 So, you might get the chance to meet his character counterpart when you walk through the park. 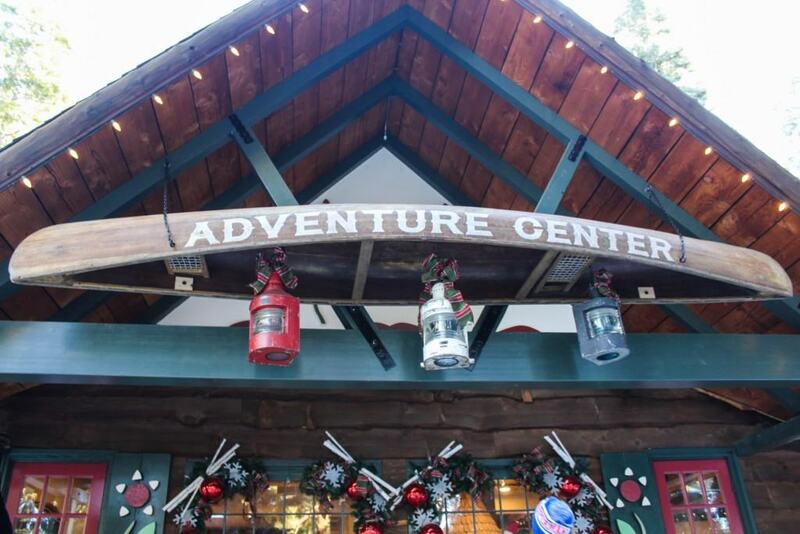 You can bring home all kinds of Arrow-themed souvenirs such as plush, cookies and mugs. 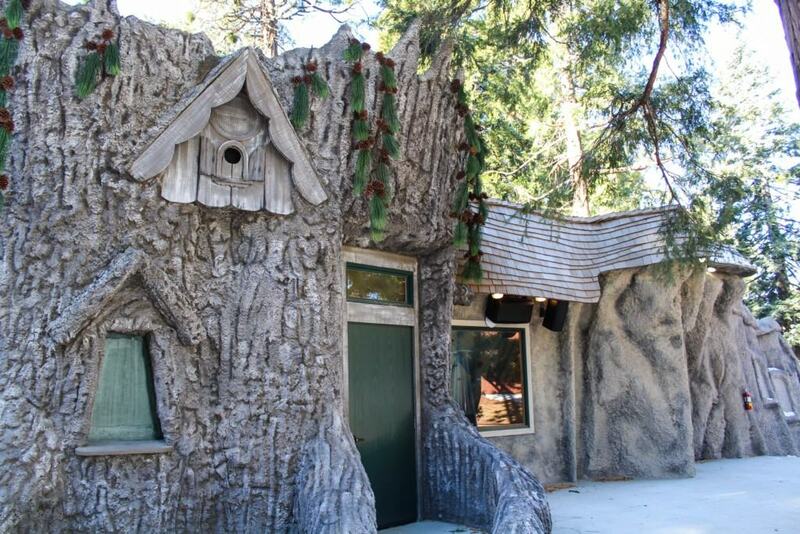 Arrow’s friends, the Woodland creatures, also like to visit the park guests. Rainbow Cave tells the story about how on Christmas Eve, Arrow has to retrieve Santa’s Magic Key from the Rainbow Cave. 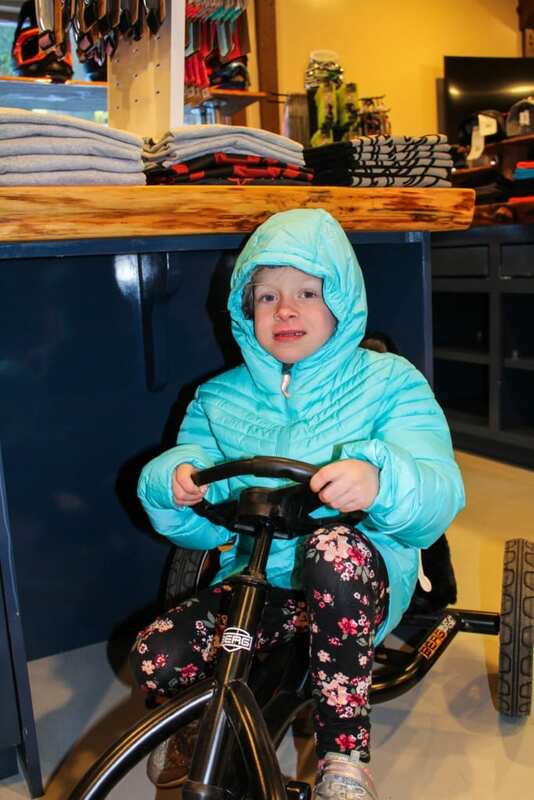 During the ride, you take a trip by pedal car and experience the adventures of Arrow and his Woodland Friends, as they set out to find the Magic Key and deliver all the Good Girls and Boys presents on Christmas. The wait time to ride Rainbow Cave goes fairly fast, especially on the weekends after 3 pm and during the week. 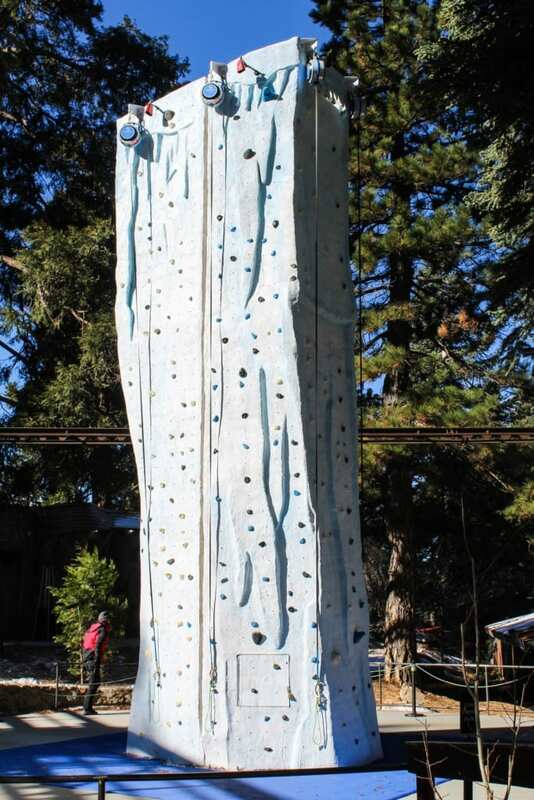 Discover your inner courage as you scale this larger-than-life iceberg themed climbing wall. 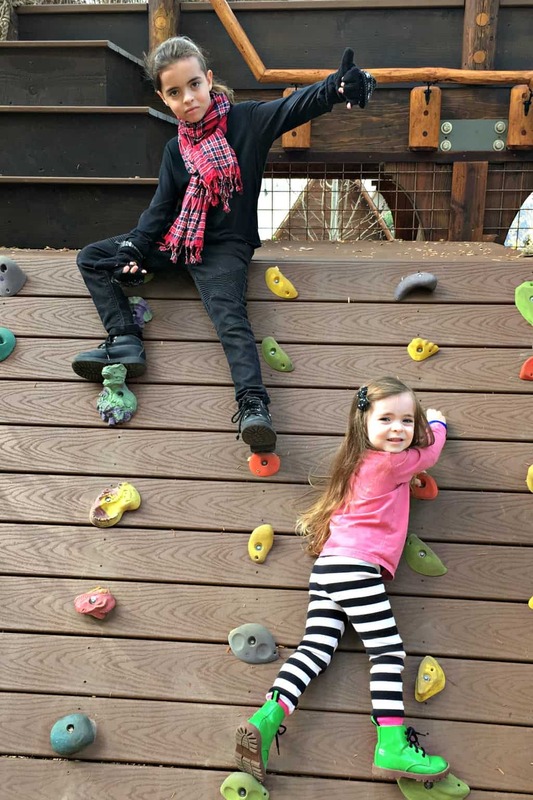 Rock climbing is appropriate for children ages 5 and up. 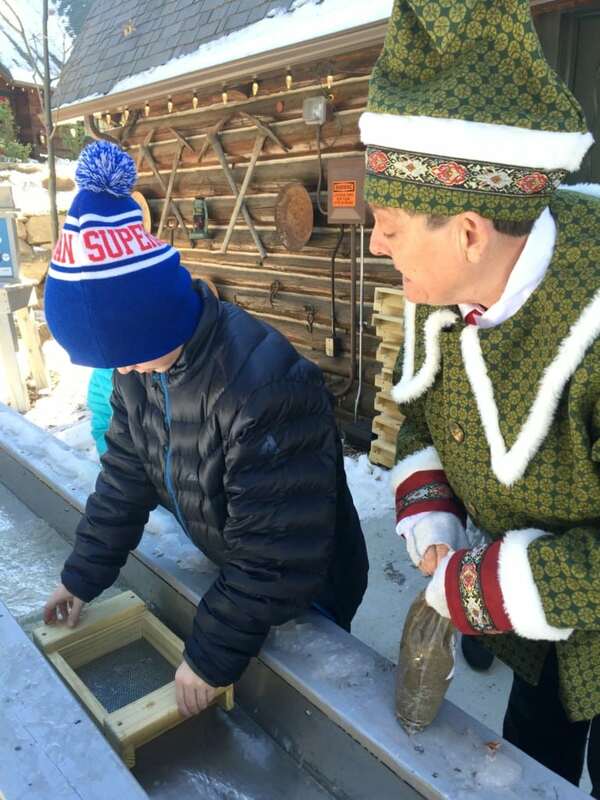 Children can mine for gemstones and arrowhead in Santa’s Sleuce Box. The fun part is that children get to take home what they find and they give you a handy guide to learn about the rocks. Take note though, in the winter you need to wear water proof gloves. 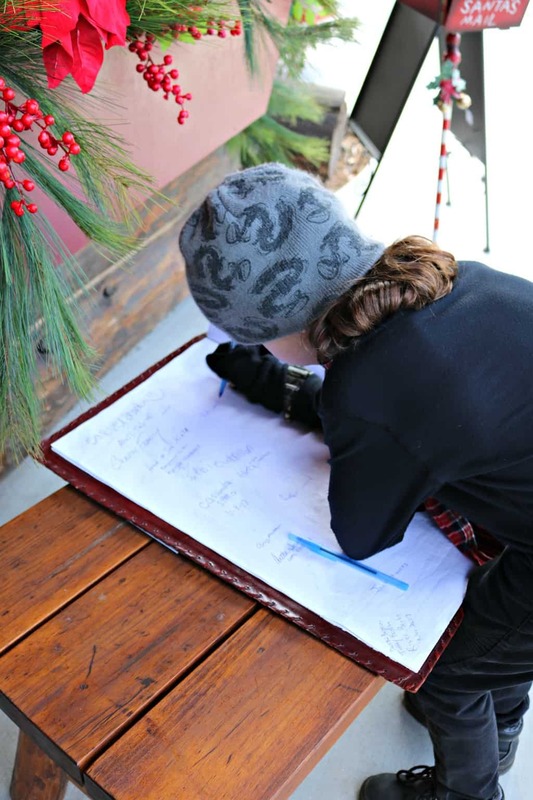 My children’s hands were freezing afterwards and we had to spend a lot of time indoors warming up. 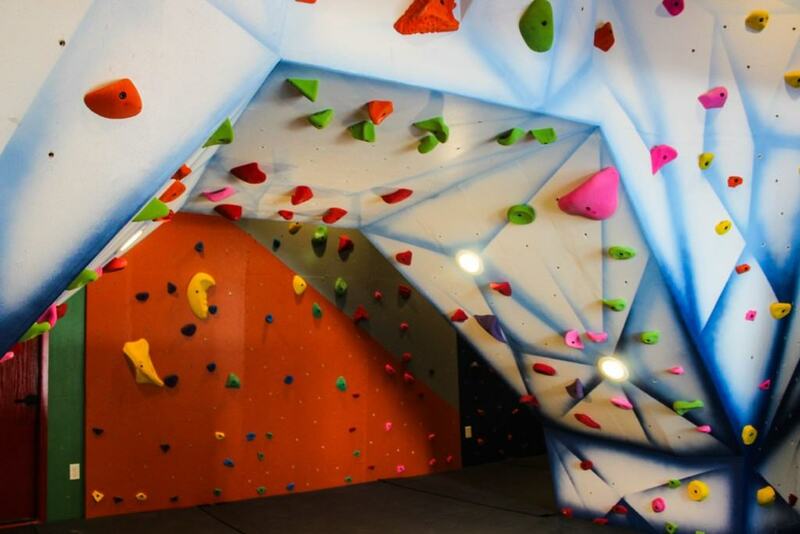 This indoor cave climbing experience is good for all ages and experience levels. The room is bright and cheery with lots of room for climbing. 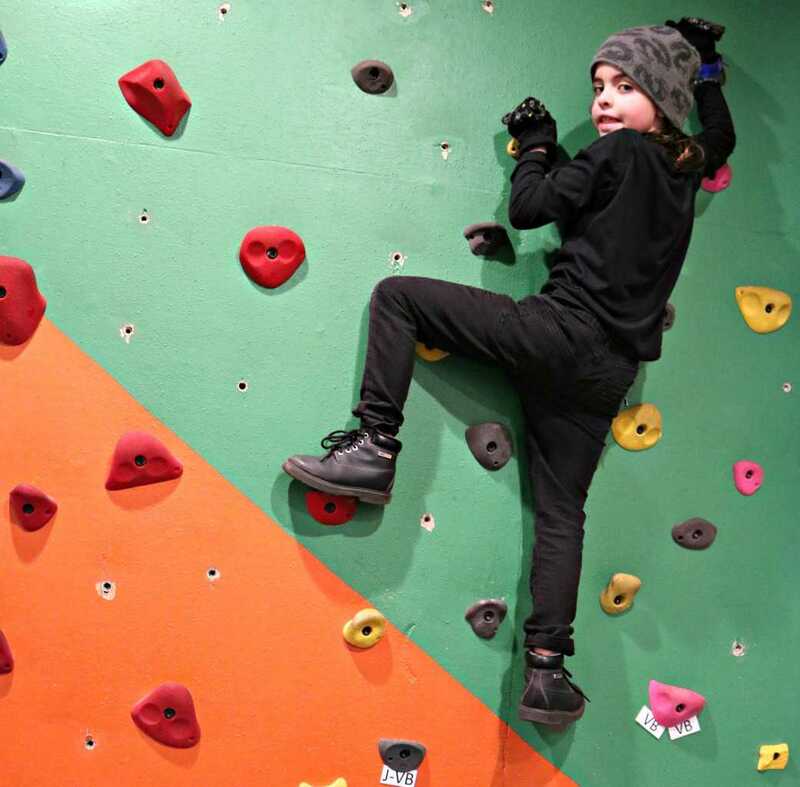 The staff provided us with complimentary climbing shoes and spotted Fran’s son as he surveyed the wall. He did quite well for having no previous experience! 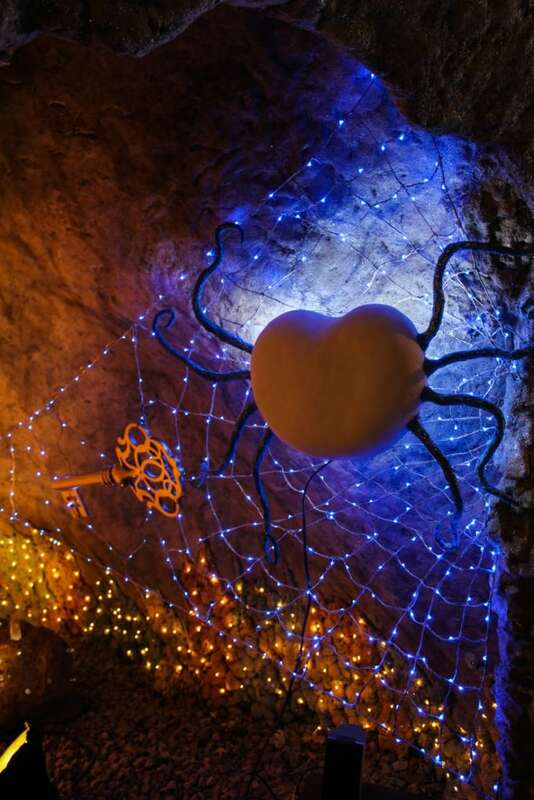 The cave is also a great place to warm up and get out of the cold. The playground is new for 2017 and bound to be a favorite. Fran and her family spent the majority of the time exploring the kids zip line, playing in the “owlery” kids house, rock climbing outdoors and jumping on the giant bouncy spiderweb. The zipline is another great new addition for 2017. You get geared up at the bottom and then walk up the mountain with a guide. Then you get launched several feet above the ground to a tower. Just make sure to arrive before 4:30 pm if you want to do it as it gets dark afterwards. 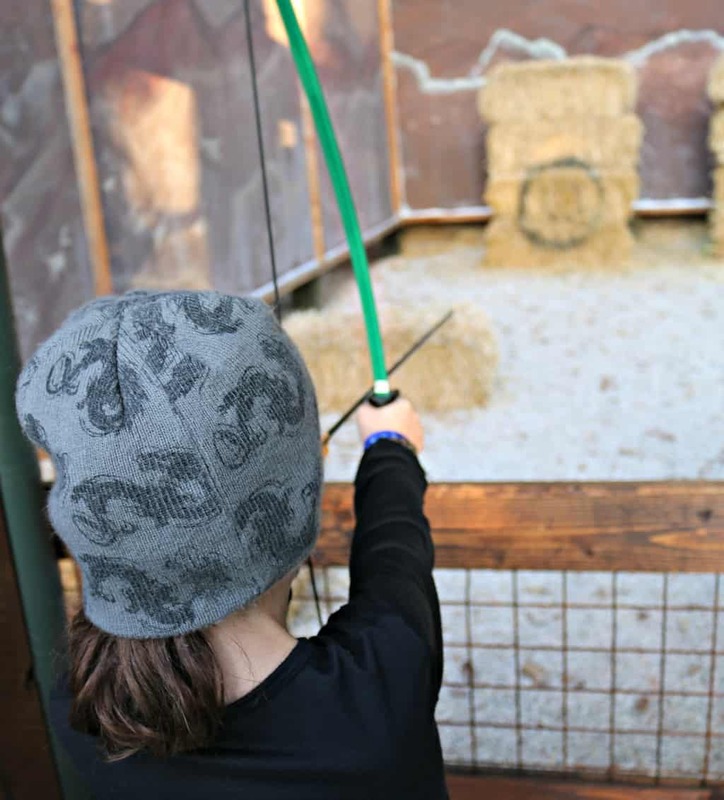 You can also try archery, which Fran’s son loved, or going on the new bungee trampoline. Santa and the Elves always have to test ride the bikes and helmets that they deliver on Christmas, right? 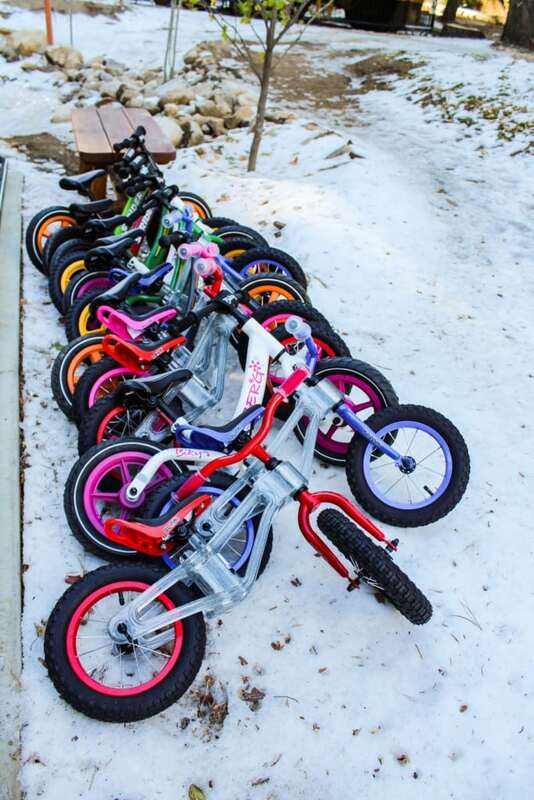 So here, you can help Santa and test ride the bikes for him. 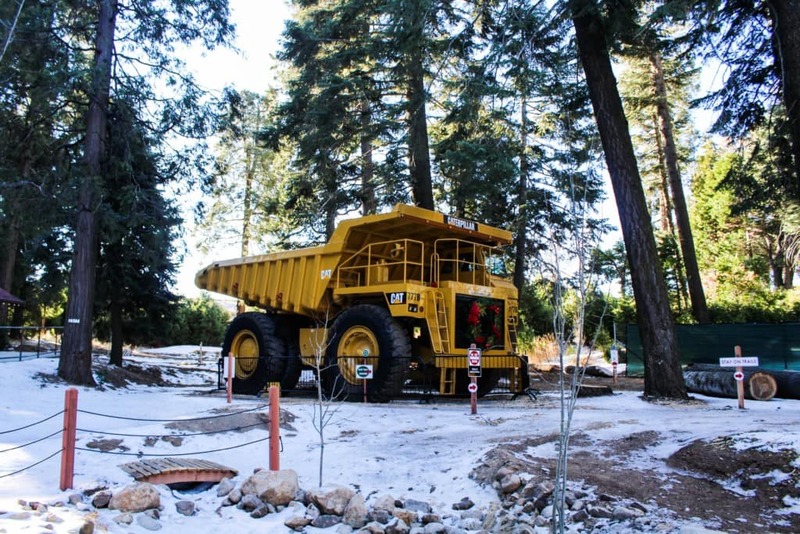 The trail meanders around Santa’s Dumptruck and is appropriate for children ages 18 months to 6 years old. Depending upon the snow conditions, sometimes the bike path may be closed. 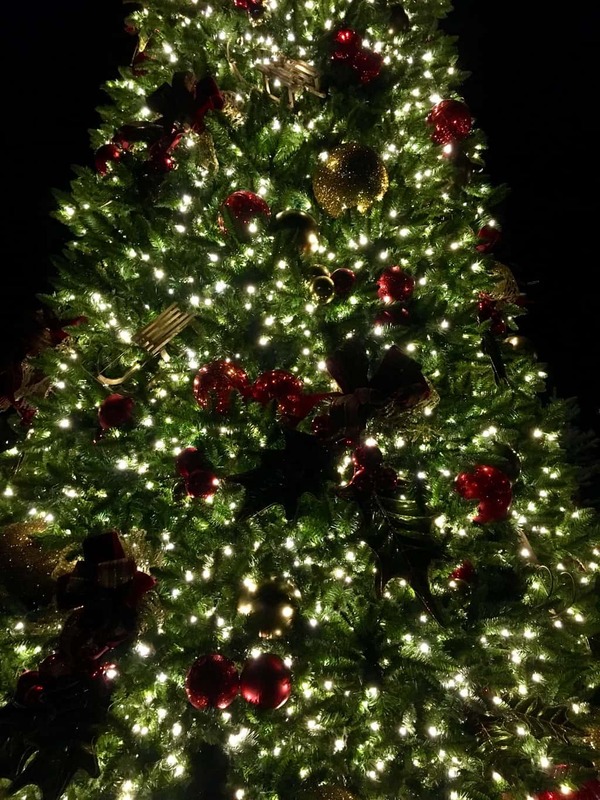 See “Making Spirits Bright” Tree Lighting Parade as the wonder and magic of Santa’s Village comes alive for a nostalgic tree lighting Parade down CandyCane Lane. 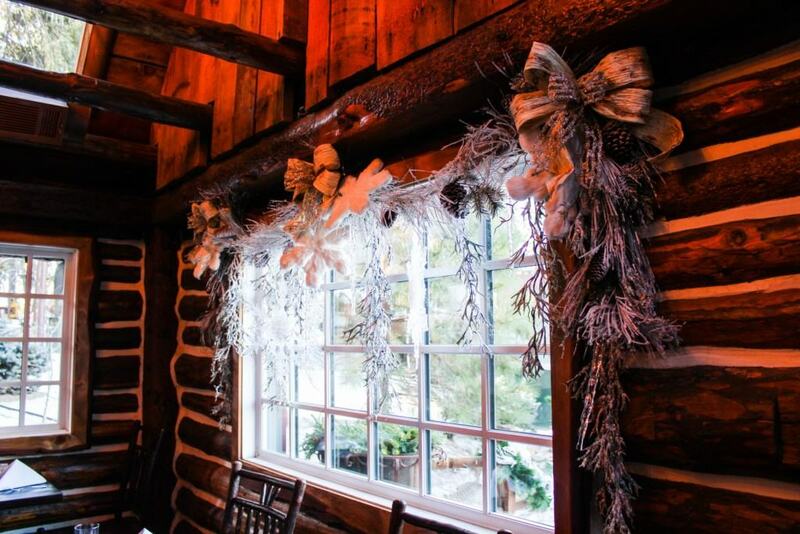 Enjoy Christmas Caroling Nightly as the choir begins their stroll from the Chapel of the Little Shepard to St. Nick’s Patio & Grille and beyond. 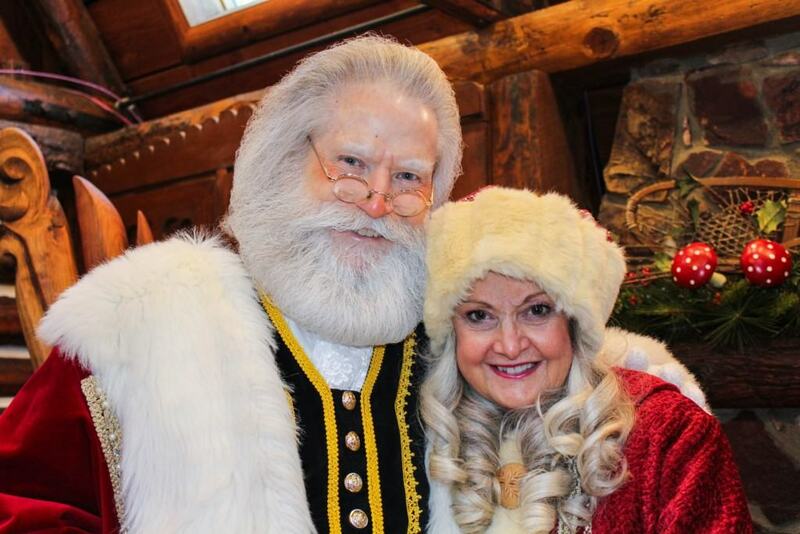 And visit with strolling characters such as Mrs. Claus, Arrow, Princess Sugar Plum and others. It is a great time to take a family photo too. 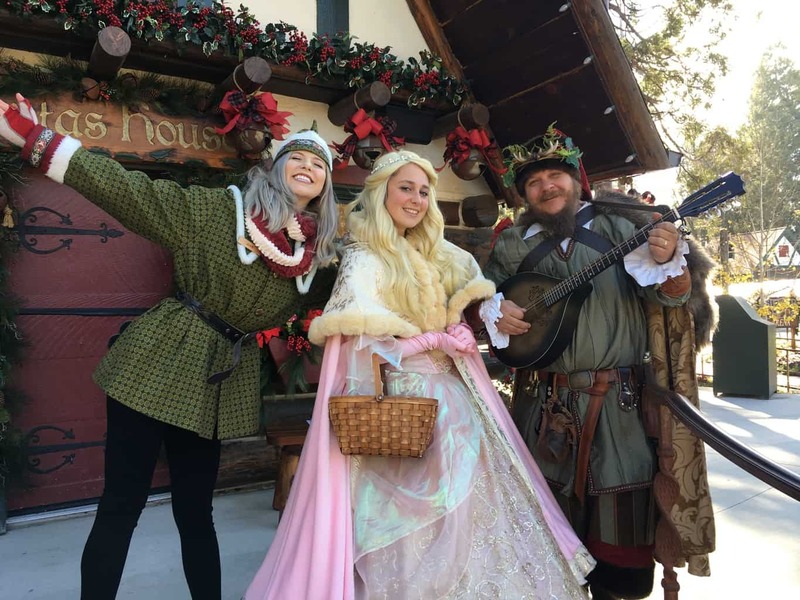 Sky Pavilion features the contagious comedy and music stylings of the The MistleTones, interactive Christmas Shows, The Elves Dance Party and special engagements by talented Village Performers. 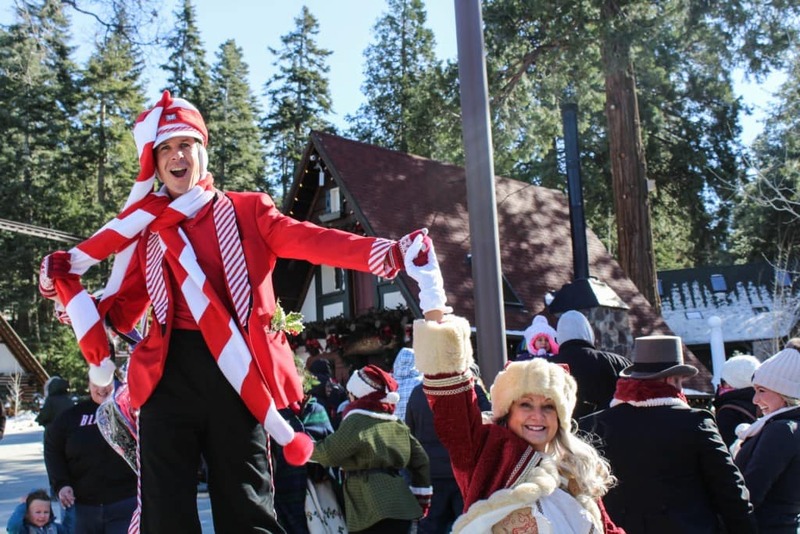 Meet the Santa’s Village Characters; Wilbur Weatheforce, Princess Evergreen, Christmas Carol and more. 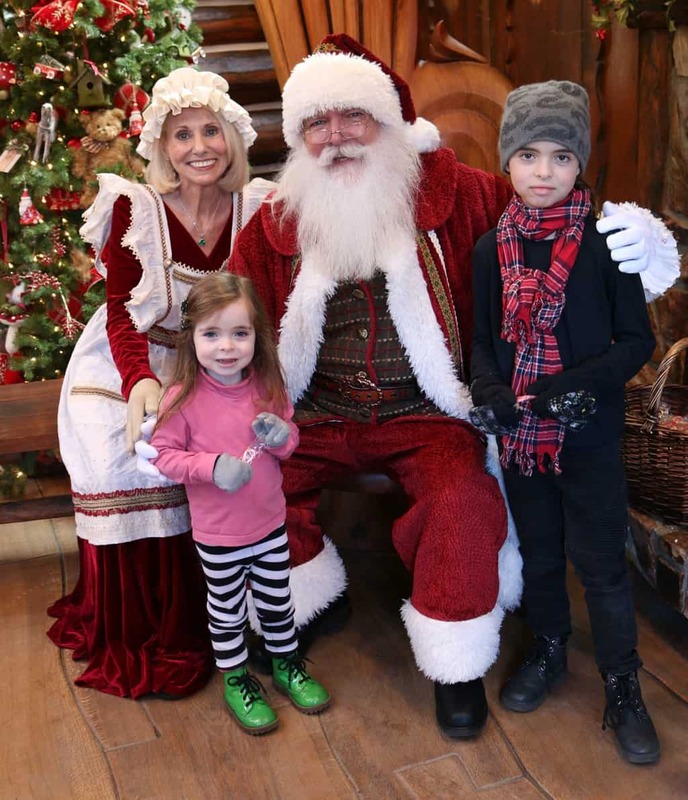 While Fran and her family were in attendance, they got to see a holiday magic show with silly jokes and entertaining one liners. 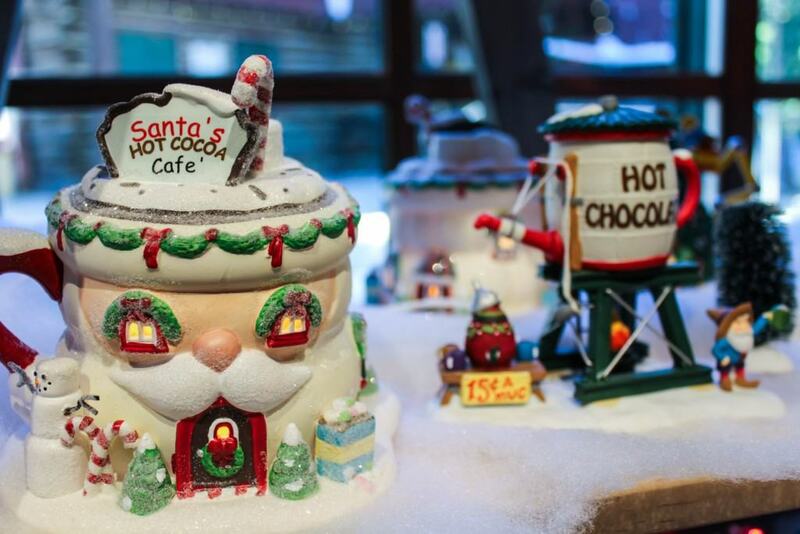 Santa’s Village has two main restaurants where you can grab a bite to eat, a candy store, a bakery and one coffee shop. 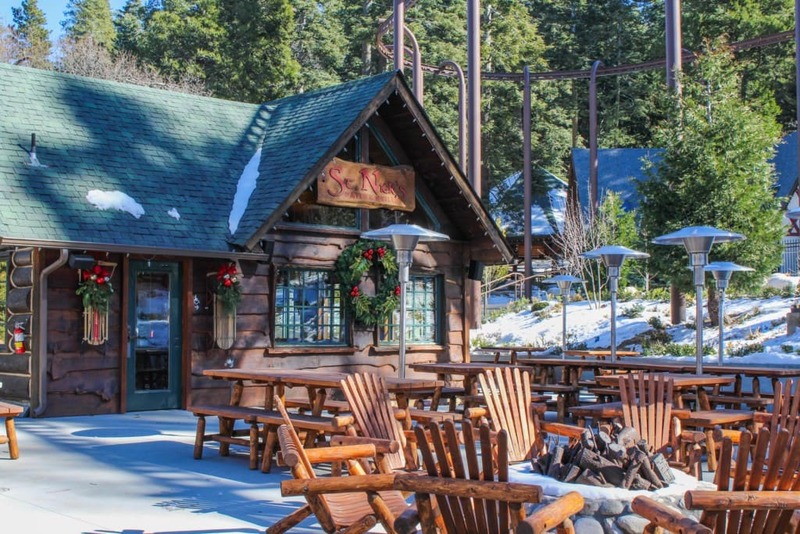 St. Nick’s Patio & Grille is where you’ll find burgers, sandwiches, soups and salads. The food was fairly decent. I ordered a chili cheese hot dog and had my children each had a kids meals – pepperoni pizza and grilled cheese. It is equivalent to what you might order at Denny’s or Norm’s Diner. 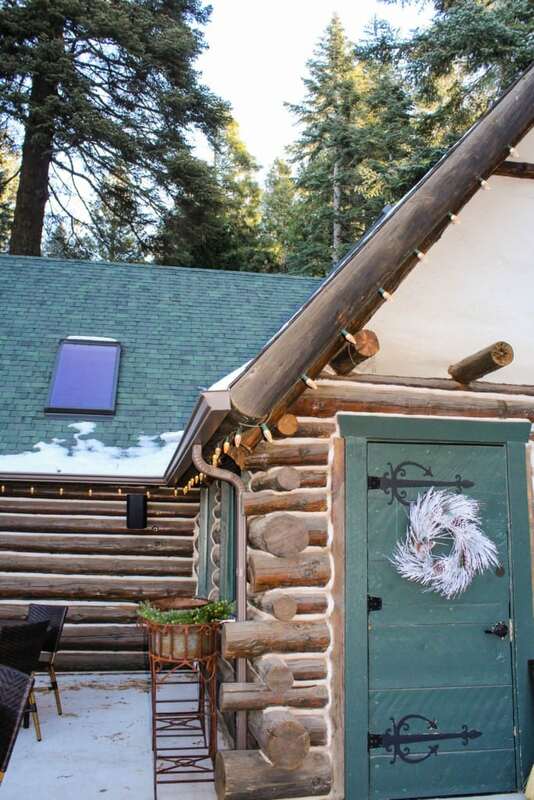 For those more willing to bear the cold, you can sit outside on the patio and cozy up around the fire pit. If you are looking for a more fine dining experience, I recommend that you make a reservation to eat at the Guardian. 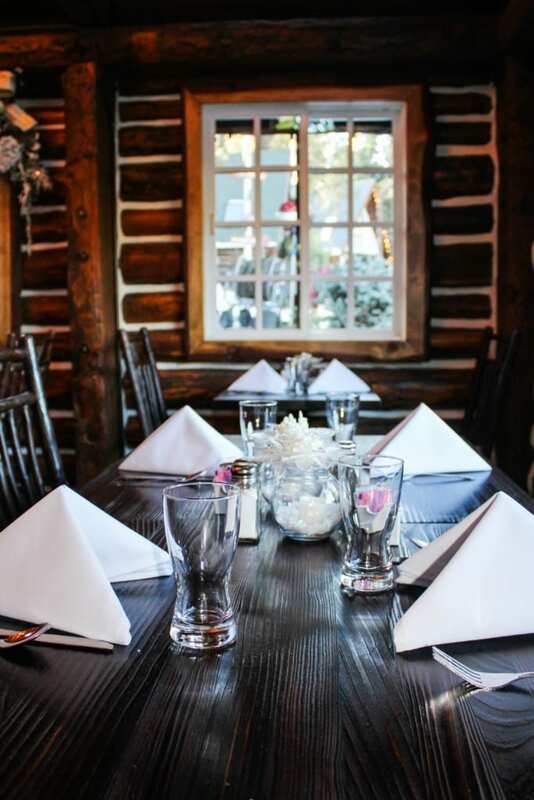 Enjoy fine dining in this bistro style restaurant and patio with a rustic and elegant ambiance. 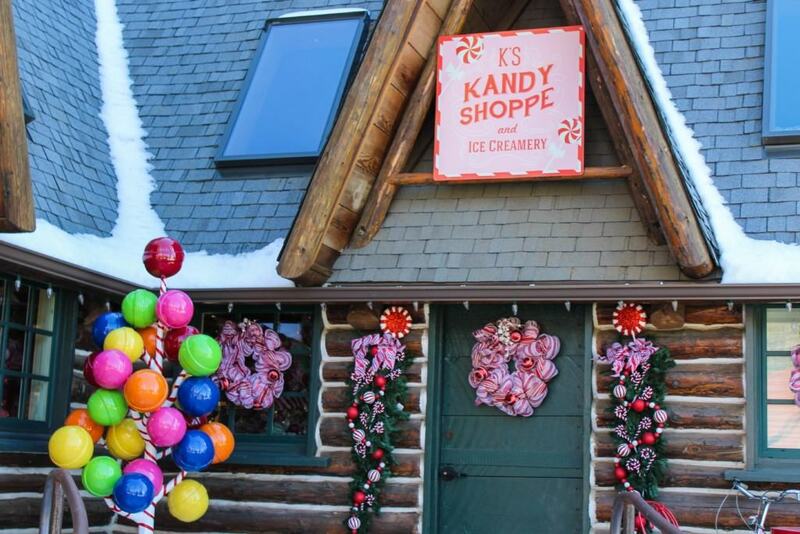 K’s Kandyshoppe and Creamery – At the previous old “Mill Wheel Toy Shop”, you can treat your family to homemade chocolates and confections. 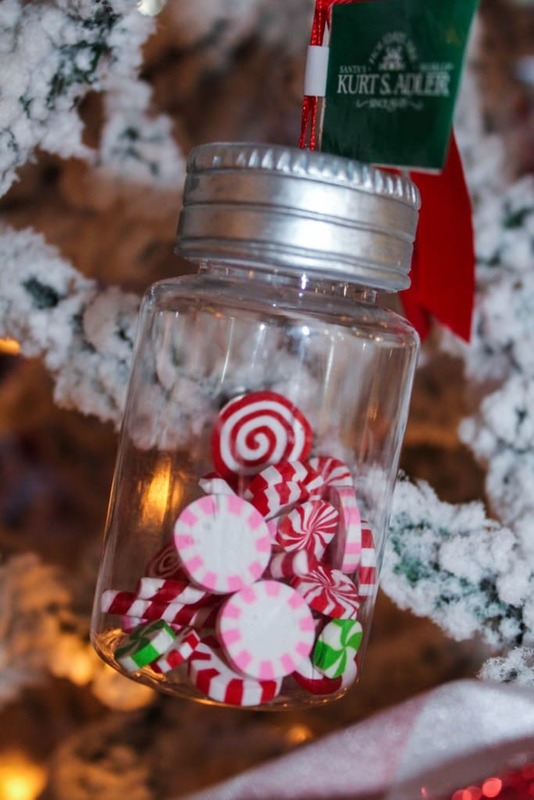 I found a wide variety of nostalgic candies and gifts from yesteryear that I purchased as presents for my kids. 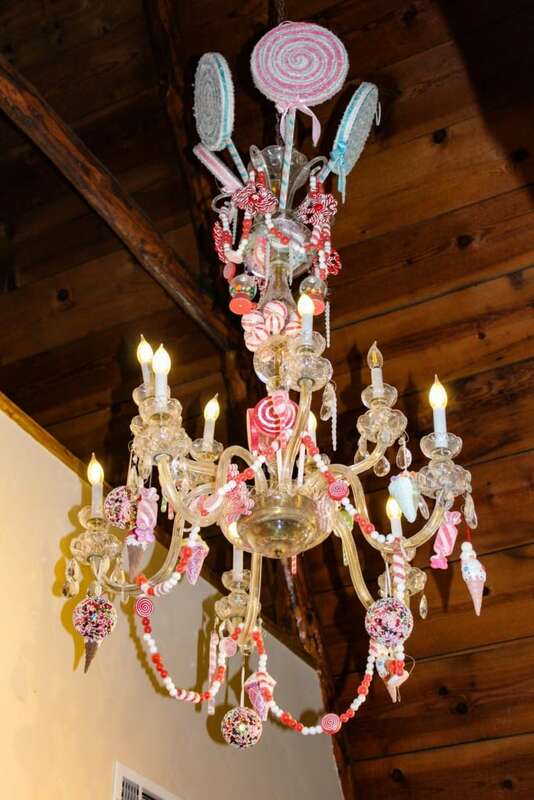 The prices were fairly reasonable with candies starting at $1. 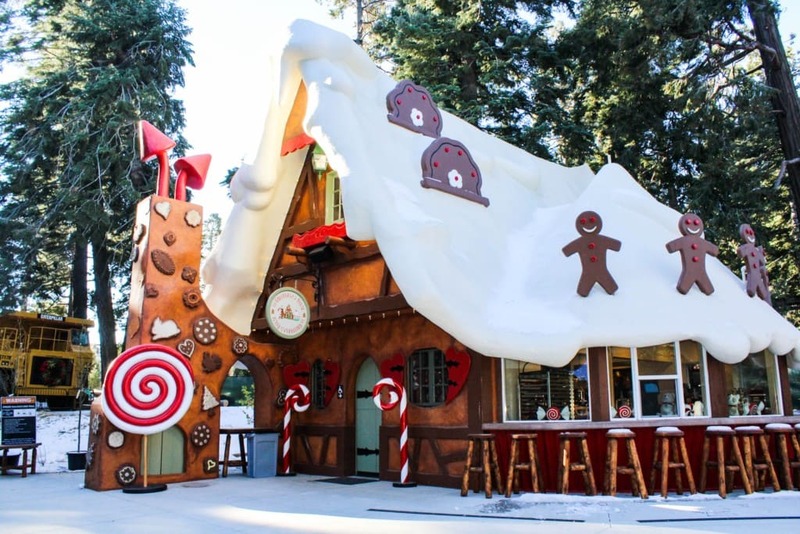 The Gingerbread House, one of the original buildings at Santa’s Village, serves deliciously tasting homemade gingerbread cookies, pastries and baked goods. 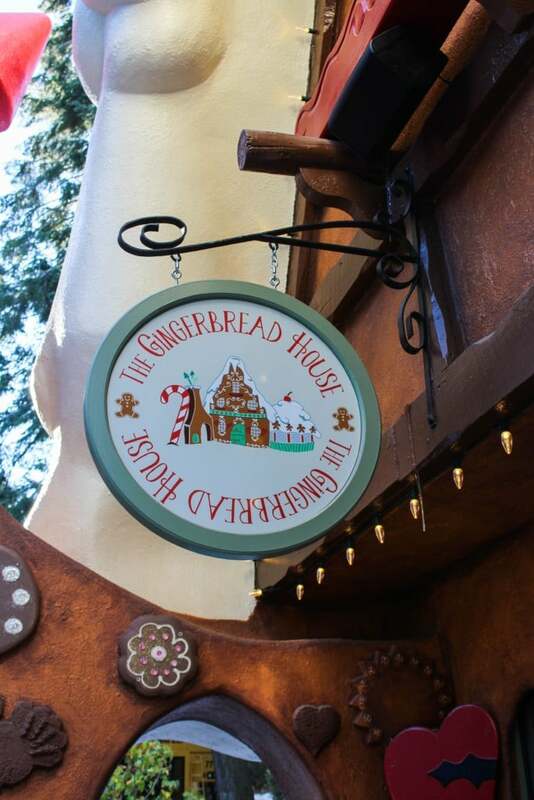 The gingerbread cookies were outstanding and I purchased one for the trip home. 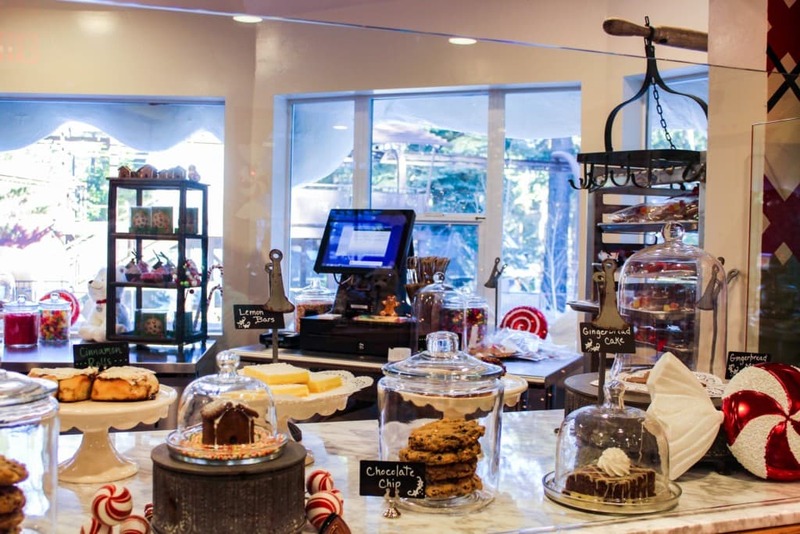 Lastly, you can pick up a cup of hot coffee or coco at Kringle’s Coffee & Gifts. They also offer grab and go style lunches. 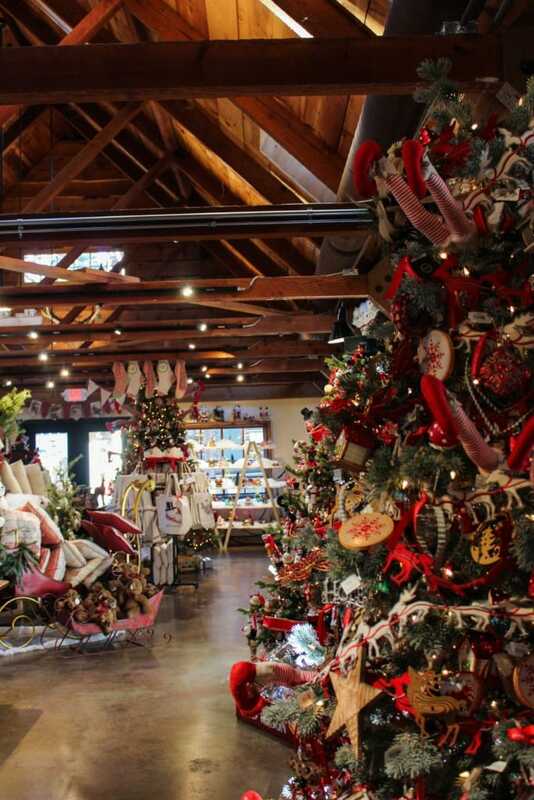 If you love to shop, then Santa’s Village is for you. 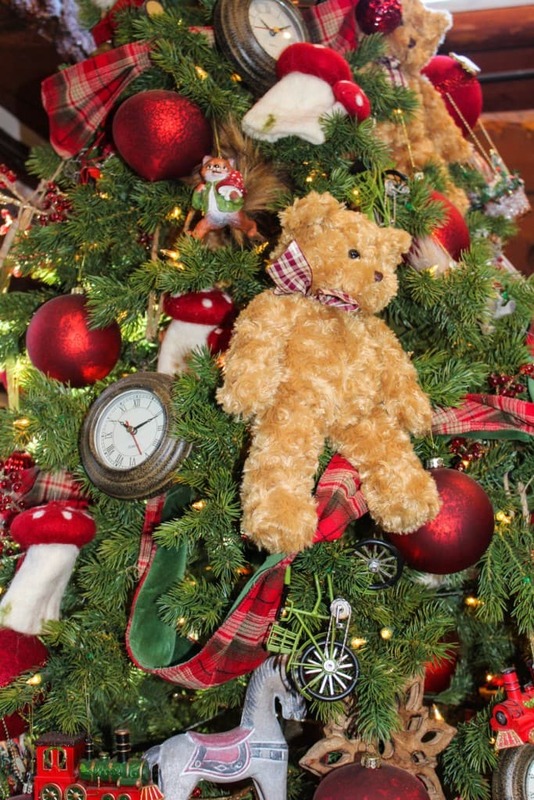 The Christmas theme park has everything festive from souveniors to Christmas ornaments to elaborate holiday decor. 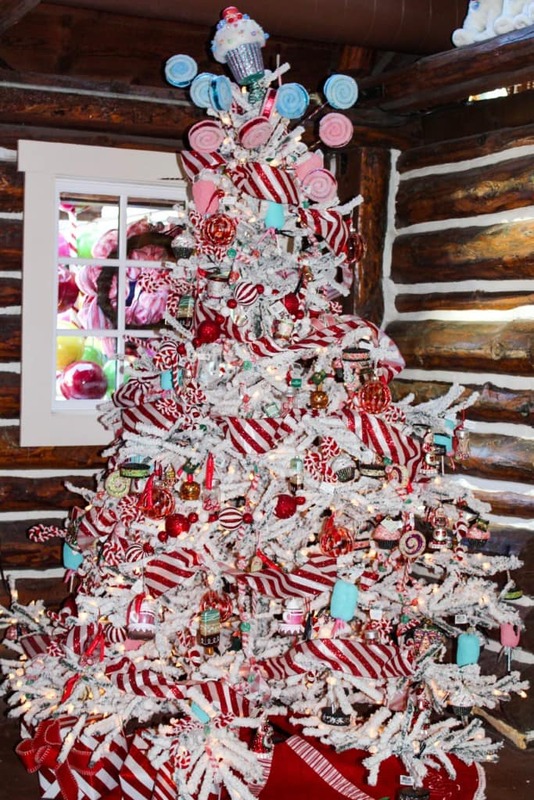 They are your one stop shop for all things “Christmas”, guaranteed! 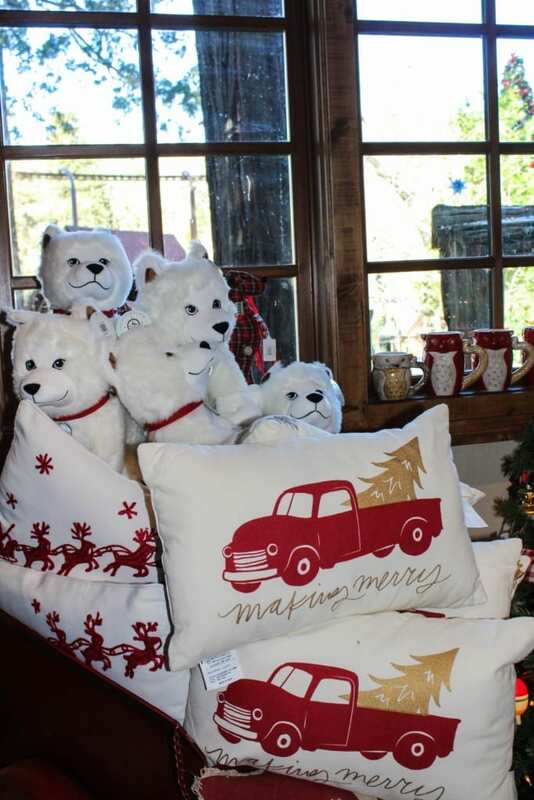 Stop in for unique gift items and nostalgic Santa’s Village Christmas souvenirs at the Sky Trading Co.
Beware though, you might just cave in and buy one of the cute Arrow stuffed animals placed all over the park. 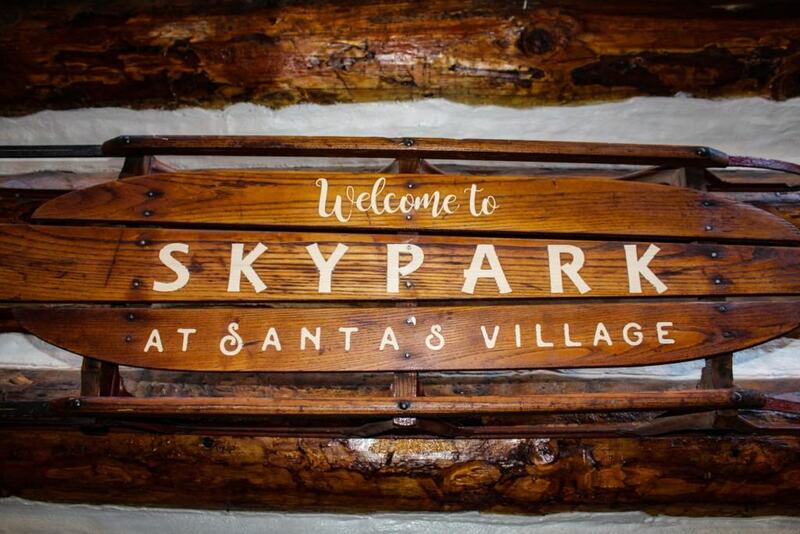 The SkyPark Adventure Center is designed for the outdoor enthusiast. 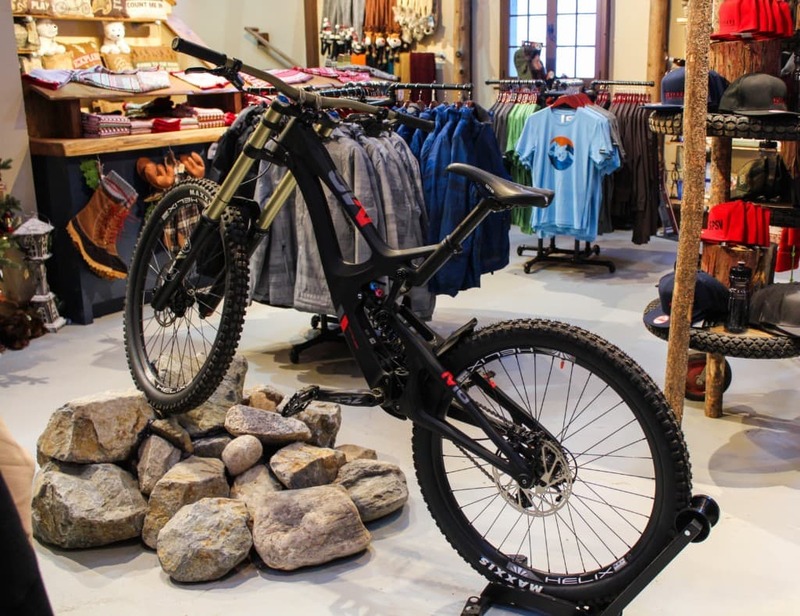 They offer a wide range of sporting equipment such as fishing tackle, mountain bikes, hiking shoes and clothing. 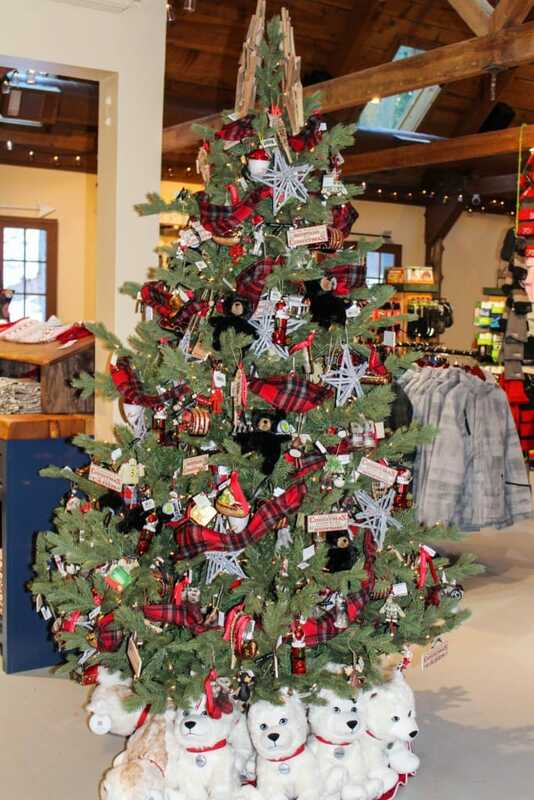 SkyPark brand apparel and gear is also available for purchase at the Adventure Center. 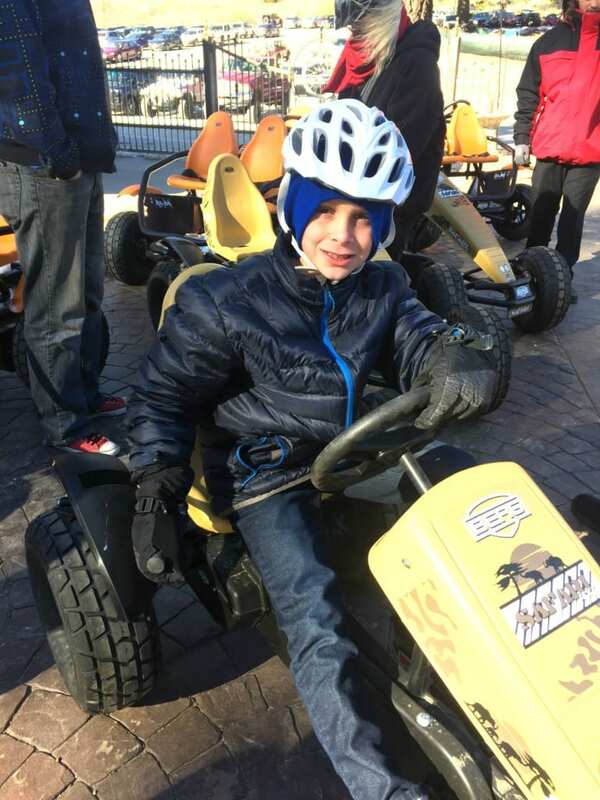 Most activities are designed for children ages 2 – 14 years old. There is no signage on the road to the theme park. So use Google Maps instead. Check to see if you need snow chains prior to going. Bring your ID for check in. Fill out the online waiver beforehand and save time. 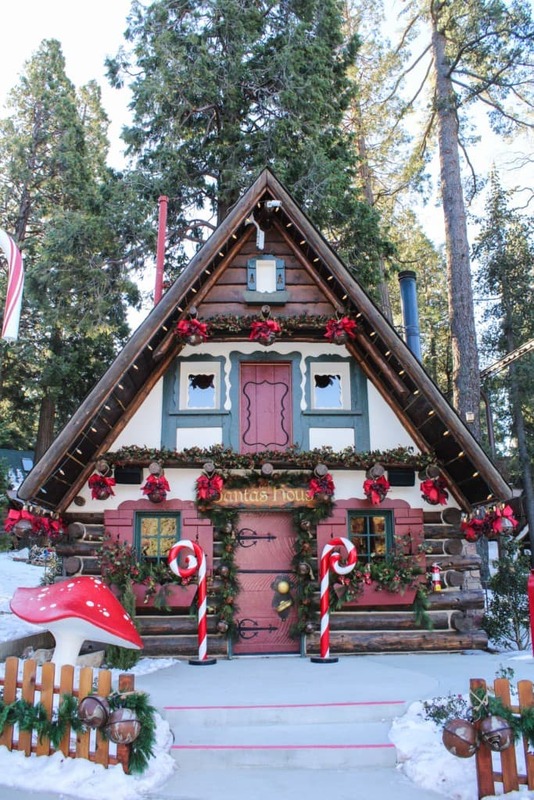 Santa’s Cabin is closed to visitors during the nightly parade. Sometimes the lines can be very long. Patience is key! Closed toed shoes are required for all attractions. Outside food is welcome and a few picnic tables are available. Dress warmly in the winter and wear layers in the summer. You can explore the entire park in about 4 to 5 hours. Admission tickets are an additional $6 at the gate. Get $10.00 off the price of admission after 3 pm. 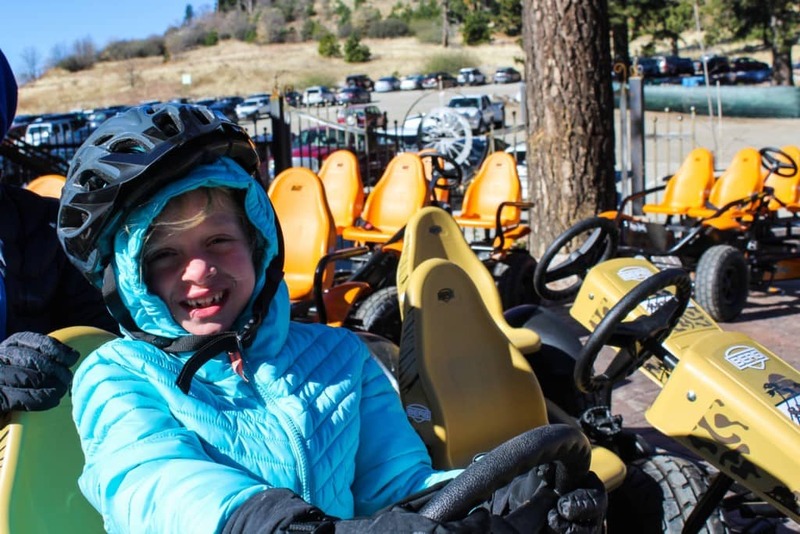 San Bernardino Mountain residents can purchase a year-round season pass for only $209.00 (with proof of residency). 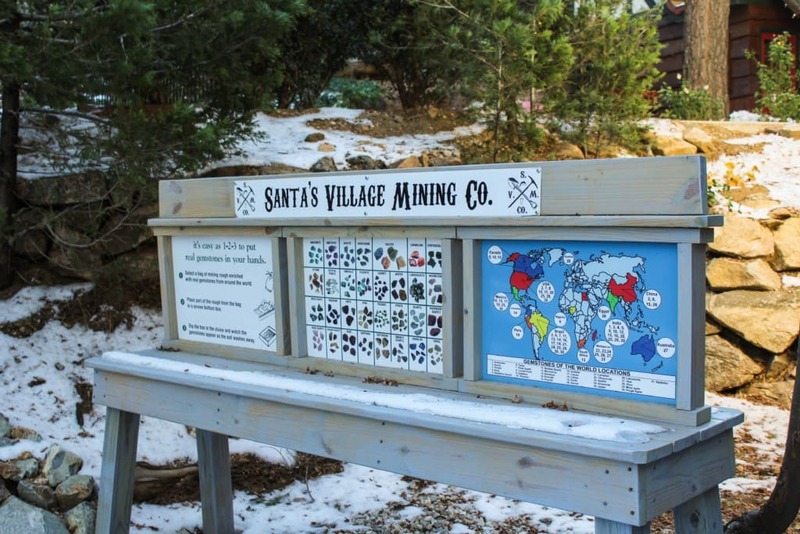 In the near future, Santa’s Village will be offering Conservation Tours, which is a great way to learn about the natural eco-system of the Park. Take a guided tour by Conservationists and see first hand how the owners are protecting the Park; everything from their extensive reforestation efforts to the addition of a new Wetland Preserve. 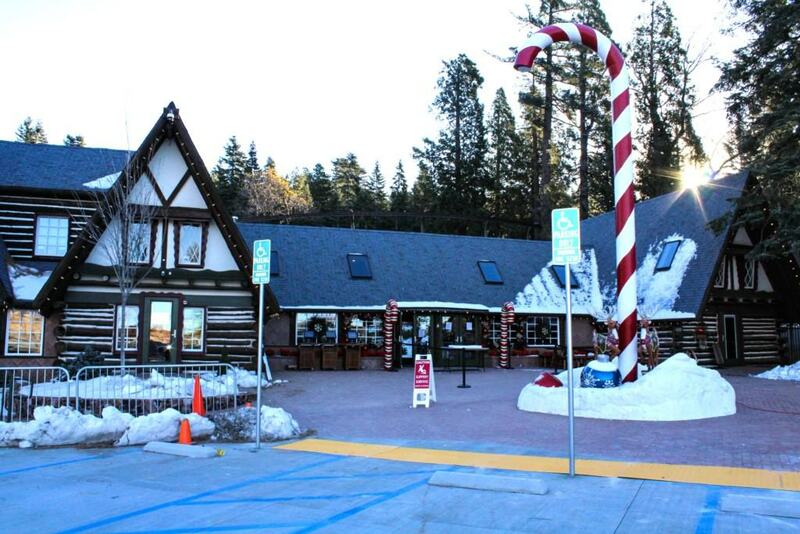 SkyPark at Santa’s Village is located at 28950 Highway 18 in the Skyforest neighborhood of Lake Arrowhead. How do I purchase the 50% after 3pm tickets online? I believe you get them insite, but make sure to call first before going!!! From now until September 1, 2017, you can purchase season passes for $99! I took my son here when he was 7, he’s now 27, should be fun to see again, but not sure the 59.00 will be worth it. Can we do a “ no ride” cheaper ticket? They don’t offer that type of ticket as far as I know.